Meters and 2 hour free parking available around Glenwood Avenue. Also, private pay parking lot connected to our building as well. R-Line stop located on the corner of Johnson street and West street. We can cater to any private or business functions. Contact us directly for more information. Pho Pho Pho Noodle Kitchen + Bar is located on Glenwood Avenue, the heart of downtown Raleigh district known as Glenwood South. With great authentic Vietnamese food, and friendly and courteous staff, Pho Pho Pho is an excellent choice for your night out on the town. Come and join in on the fun! Pho Pho Pho Noodle Kitchen + Bar has something for everyone. 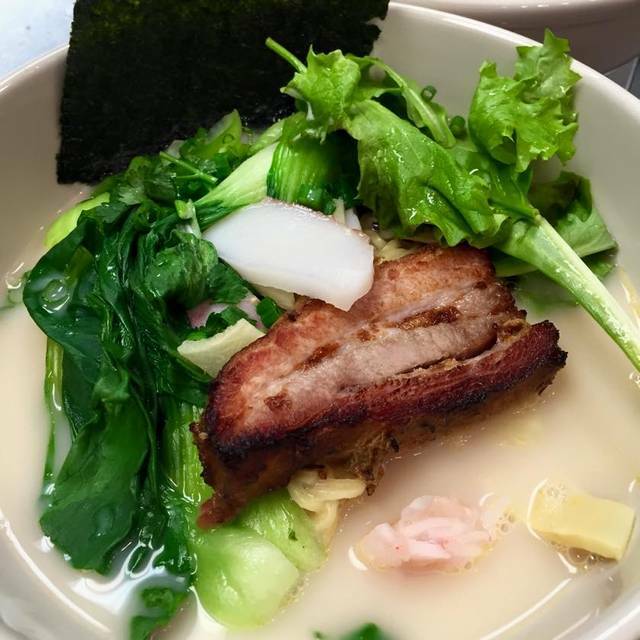 Enjoy fresh appetizers, Pho noodle soups, a bowl of tasty Ramen, vermicelli noodles with grilled pork and short ribs and even house made yogurt for dessert. We also have vegetarian options and gluten free items as well! But, don't stop there. Have one of our featured craft cocktails from our fully stocked bar and lovely bartenders, or choose from a wide selection of Asian and local craft beers. We also have a great wine list to satisfy everyone's taste. If you have an event coming up, we can cater any size party. Please contact us directly if you are interested in hosting an event. Food was great. Service was faster than in my previous experience here. It was the night of a St Paddy’s Day festival so the area was crowded but overall a great meal. We showed up at 7:30 and every table was full. Clearly they don’t monitor open table for upcoming reservations. 30 minutes later we were seated. The food was ok. But nothing stellar. The good part was the service was quick once we ordered. Spring rolls in my vermicelli salad were frozen in the center. A new batch was brought out, but they were refrigerator cold in the center. Staff was very nice and did not charge for our entrees. Been searching for good Vietnamese food since moving to Raleigh six months ago and still haven’t found it. No one seated us when we first got there, we eventually sat ourselves. We ordered tea to drink and were told it had been discontinued (yes, discontinued). When we got the menu one half was blacked out in black sharpie, same for the back of the menu. We went to dinner early (6:30p), but the food still took about 45 minutes to come out-and there were only two other tables besides us. The chicken was burned on chicken salad dinners, we sent it back. Didn’t want to wait another 40 min so we just called it a night. Other dinner did not come with the side pho soup as it was supposed to. Told waiter, but we just wanted to pay and leave. Waiter was nice, he apologized for everything here and there.. but whole experience was pretty much a wash. I would not recommend this establishment to anyone! There are way too many places to eat which are not run so poorly. We had three different kinds of pho, all with seafood, one special-ordered with a vegetarian broth. The non-vegetarian broth was near-tasteless. The vegetarian broth, mushroom-based, had flavor but was oddly sweet. The dish was 95% noodles. Very little seafood to be found. The shrimp were way overcooked - like rubber. Squid was almost nonexistent. Mostly we saw fishballs, which were as rubbery as the shrimp. Pretty disappointing meal. Edible, but disappointing. The broth was so good and flavorful! I ate the whole bowl! Food was ok, but then anything is good when you are really hungry. The place was only about half full on a Saturday night in the downtown restaurant district. No street parking or dedicated lot, so you have to circle or park in a deck that cost $10 for 2 hours. Despite arriving a few minutes early for our res, it took a full hour to get our food (hence the 2 hours' parking). On of my dining friends said the pork was gristly in his sandwich. My rice and salmon dish was swimming in sugar, no respite with any plain white rice as it was soaked too. Also rice bowl-type dishes need to be served in a bowl, not on a big flat plate with chopsticks (and chopsticks was my first eating utensil). The dealbreaker is that it took an hour. An Hour. When we asked if it would be much longer, the waiter told us that the salmon takes a long time. If you ever cook fish with a seared crust, you know that it's over high heat and done quickly, so I give him the benefit of the doubt that he doesn't know how the food is prepared, rather than calling it a lie. Given that in a restaurant, the rice is precooked, the pho stock is precooked; at most the pork and salmon are ready to go on the grill, waiting a full hour is inexplicable. We almost left and doubt we will return. We arrived and sat ourselves without a menu. We waited on a menu/water/server for 5-10 minutes. After ordering, a table sat next to us and received their entrees before we got our appetizers (we ordered the same entrees). Order a boba tea and they didn’t even have the tapioca boba bubbles. An hour and a half later we were finished and had to wait on our check! There were 4 tables MAX in the restraunt, it wasn’t busy at all. I would not recommend this restaurant even to a person I disliked. The service took about 45 minutes to get four dishes from, when there were only about 4 tables of guests in the restaurant. This was not an exception, as after speaking with the table next to us learned that they too waited over 45 minutes to get food. As a diner, we viewed the manager visibly yell at an employee. After leaving the restaurant, and visiting another business on Glenwood for an after dinner drink, it was confessed to us that the servers also prepare the food for diners. We could not confirm or deny this rumor, however if it were true we would not be surprised. Again, DEFINITELY WOULD NOT RECOMMEND THIS PLACE! Always pleased with this place. Our server was friendly. The liquor drinks were particularly great this last visit. I will always be coming back. Great food and drink specials. Staff were super helpful and attentive. Will be back! Great service, with a nice spin on Vietnamese cuisine. The Pho had a great broth, one of the best I have tasted. I had a Mojito but it had the taste of old lime juice, needed to be fresh squeezed. But outside of that everything was excellent. The waiter was great, very helpful and attentive. The food was fair, not as good as I thought it would be, but not bad. The drinks were great and the restaurant's atmosphere is very nice. Food was subpar for experienced Vietnamese eaters. Broth was weak and not full of flavor like it should. Stale steam buns. Tough pork in bun bowl. Very little produce in vermicelli bowl. We were disappointed. And it was expensive!!!! $40 for dinner with no drinks and one app. That's a lot for bad Vietnamese. Great food, excellent service. Really enjoyed checking out all the choices. A bit chilly and totally funny but weird movie playing! Pho pho pho has good food - same every time we go - keeps us coming back! I love the Open Table reception, steady menu and Jet Li movies. I had the house salad for the first time tonight and it was a perfect compliment to the grilled squid. The Bahn Mi did not disappoint my husband and we left full and happy. Chose Pho Pho Pho because it was a well-reviewed spot with options for team members who aren't big meat eaters. Service was great, the portions quite generous, and the Ramen was quite tasty. Drinks were a tad spendy, and the seating left a bit to be desired in terms of comfort (style over comfort is an unfortunate choice for any restaurant, but all-too-common) - but those are the only dings I can give Pho Pho Pho. Would definitely return if I am in downtown Raleigh and in the mood for Ramen or Pho. Relaxed, casual, delicious! Would definitely recommend if you enjoy Asian food! Went during Restaurant Week but had been there before. Special menu very con fusing as to what was covered. Chicken salad very tasty but Pho was not as good as previous visit. The pho was so so good, as well as the steam buns with pork belly. I recommend adding extra veggies to your pho! You won't be disappointed. Excellent menu and options. The appetizers (wings, dumplins, rolls) hit the spot. The pho soup was delicious, as was the Ramen dish. Service was a slow but very friendly and knowledgeable. Pho Pho Pho was not busy, and the music was just the right volume so we could laugh and talk. We LOVED the music. We also enjoyed the open air atmosphere looking out onto Glenwood South on a Thurs. eve. I'll be back for sure! The Menu was small and the food was extremely bland. They charge $13 a bowl on average for food that costs them very little make. The portion looks sizeable but is an illusion due the large amount of broth and very little substance in the bowl itself. Horrible service!! We waited for an hour for our pho and ramen. After an hour the manager came and told us they ran out of broth. She said it may take 10 more minutes to prepare! We had to cancel our order. We only got to try their appetizers which was pretty nasty. The spring roll and shrimp dumpling was served to us cold. Frozen dumplings and spring rolls I get from Trader Joe's taste even better. Overall experience was absolutely disappointing!! Will never come back to this place again!!! First trip to Pho Pho Pho. There were three of us and we sampled the prawns, calimari and several pho dishes, along with an order of spring rolls. The prawns were grilled and had a great smoky flavor, the calamari was totally identifiable as a squid with tentacles and tail. Both were terrific. The pho dishes were flavorful and of a reasonable quantity. I saw several diners taking food home. The beer list was so-so and my wife and friend found a wine to enjoy. The service was very good and the ambiance was pretty noisy. Lots of hard surfaces. All in all a good place and worth the $. Great service, great food, great atmosphere!!!! The pho and banh mi were awesome. Flavorful and fresh. The drinks were great, too. I had the house mojito and it was delicious. This is my 3rd time at this restaurant and I'll definitely be back. Although our pho came out before the appetizers, it was delicious. Drinks are not weak. Steam buns are the best! I really love the food at this restaurant! The location is great and the staff is very friendly. The only downside is that every time I come it takes awhile to receive the food. I sometimes go on weekdays as well and the food still takes awhile. So just be prepared to wait. Outstanding!!!! The food was good and we thoroughly enjoyed the Vietnamese cuisine . My friend and I had wonderful cocktails and shared several appetizers on Sat. early evening. What a treat! The steam buns with pork belly are a religious experience! The pho was very good. We had the Raleigh restaurant week menu which was a really good deal. There was more than enough food. We left stuffed and had leftovers. It was a great dinner. We will come back. I have attended Phox3 several times with my friends and always had an excellent experience. This time however was very poor. The service was terrible - it took us over an hour to get our appetizers, when they finally came out some were wrong and the service was extremely unapologetic about it and tried to pass it off as if it took so long on purpose. My friend ordered Oxtail and she could hardly even eat it because it was so tough. While my past experiences have been relatively positive, this time was the absolute worst service I have ever had at a restaurant. If it weren't for it being one of the only pho places in Raleigh I might not ever go back. The food was very good and the service, for what it was worth was also very good. THE BIG PROBLEM was that they were SEVERELY understaffed the day that we went. Due to this, all available service personnel were doing multiple things at once and it seemed somewhat chaotic. The food took forever to get to us, which was not a problem with the service staff, but due to the fact that they were understaffed. Would probably go back for the food.